Congratulations to Roger Penske and the No. 2 Miller Lite Dodge, crew chief Paul Wolfe. And Roger, we had you up here on Friday, and I know this has got to be just a terrific moment for you, not only professionally but personally. Congratulations on winning the 2012 NASCAR Sprint Cup Series championship. Your thoughts? ROGER PENSKE: First I want to thank the media and obviously all the fans that turn out for these races for 38, 39 weekends around the country and all the folks in our company, some 40,000 that supported us. But I guess this was the plan. We talked about it earlier this week, and we stayed on our plan. Obviously the man on my left, Paul Wolfe, was a great operator from the standpoint of getting Brad where he needed to be, pulling this team together over the last three years. He’s been amazing. And for me, it’s a goal that I had. You could see that it wasn’t easy. It just didn’t line up and go today because Chad Knaus and as I said, the elite group, Hendrick’s boys and Jimmie Johnson were very strong today and they were throwing everything they could at us. It’s something I can’t hardly believe right now. I played this race in my mind over the weekend so many times what could happen yes or no. But I guess when Jimmie lost that lug nut, I said someone gave us four aces right there in our hand, so what we need to do is be sure we didn’t drop them. But I just want to thank Paul for the great job he’s done in building this team. Q: Paul Wolfe, just talk about what it means to be a championship crew chief and just the thoughts about winning here today at Homestead Miami, winning the championship. PAUL WOLFE: Well, it’s obviously very special, not only for myself but everybody at Penske Racing. So much has gone into this, and I’m thankful for the opportunity that RP has given me and Brad. There’s been plenty of lists we’ve passed his way of things we wanted, and it was our job when we got those things to go out there and perform, and I feel like for the most part we’ve tried to do that, and over the last three years we’ve been able to accomplish a lot of great things. For me personally, I haven’t taken a whole lot of time to think about what this means. As we got into the Chase, it was taking one race at a time and trying not to think about the championship and getting maximum points that we could and running as well as we could, and it came down to today, to being in the position that we were in. Obviously I was a little disappointed in myself that we weren’t able to give Brad a better car today. Definitely made it one of the toughest races of my career to date, and I think a lot of that just shows how tough it is to win at this level and win a championship like that. To be able to battle with Chad and Jimmie in this championship even makes it more special to me, just knowing how great those guys are and what they’ve been able to accomplish. I don’t know, I’m just going to take some time to sink in, but just real proud of the effort. It was exciting to be able to get Dodge a championship, this being they’re leaving the sport this year. It was very cool and all the support they’ve given us to make this happen over the last three years. Proud of the effort, and we’ll have to see how I feel tomorrow morning. Q. Roger, over the years, especially in the IndyCar racing, you’ve had an awful lot of awfully big sponsors. You’ve had some drivers give them a lot of bang for the buck, Rick Mears and Helio for Marlboro, et cetera. But have you ever had a driver give your sponsor more bang for the buck than Brad Keselowski did on his live SportsCenter view a while ago while he was cheerleading the crowd and telling his life story pretty much in good, down home tavern talk? ROGER PENSKE: Well, that’s good. I saw him as a great driver, a good tactician. I didn’t realize he was commercially viable. I guess he was tonight. Q. Paul, it sounded like on the radio in those final laps you guys wanted at least 16th to sort of remove any thought that you might have backed into this. Was that the case? PAUL WOLFE: Yeah, it’s funny, when we pitted there and Brad came over the radio and asked what position we were in and I told my engineers up on the box, communicating between them, I said, you know what he’s thinking? He’s thinking he wants to finish 15th because at that point it didn’t matter what happened to the 48. And that just shows the dedication and what this means to him. Sure enough, it wasn’t but a few laps later when he came over the radio and said that. I don’t know, we just think a lot alike, and I knew what he was thinking at that point. I think that as bad as we ran tonight that that made it more special that we were still able to finish 15th regardless of what happened to the 48. Q. Roger, no one would ever question your dedication in all of this, but when you look at the kind of person that Brad is, does it make you want to just invest yourself even more because you want to get behind this kid because of who he is? ROGER PENSKE: Well, I think I’ve said it before here I guess on Friday, it’s not how much money you put into your race team, it’s all about the people and the human capital, and I guess Brad is right at the top. When he came in and said, look, I want to help you build a championship team, he looked me in the eye and shook my hand, and that’s how we started, and there’s no question that he’s delivered way above what both of us probably thought was possible when you look at the competition and what we have to deal with. But he’s a great leader on our team. Obviously I remember I said, I think, earlier that he said, I’m not helping Kurt Busch enough, meaning he wasn’t good enough at that point. But when he took over the leadership of the team, I said to him, you’re going to be the leader of this team, and I think that you’ve seen what’s happened. He hasn’t missed a step. He’s galvanized the team from the standpoint of leadership with Paul and the whole team, and I think never does he miss a day coming in the shop, putting his arm around the guys, and that makes a big difference. You can be a big shot, but you’ve got to get down on the ground and work with the guys that are doing all this work day in and day out. For me this is what I love, taking people within at organization and seeing them flourish, and he certainly has today. Q. How much of Mark Donohue do you see in a guy like Brad Keselowski, both great setup in cars, and Mark got you your first NASCAR victory and Brad got you your first championship. Talk a little bit about that because you have a pair of eyes that nobody has, you can see things that other people — you see further down the road than a lot of us. ROGER PENSKE: Well, I guess when I compare the two, these are guys that would work in the shop. I remember many nights Mark Donohue would work all night in the shop and get in the truck and tow the car to the races, and that’s the kind of background that Brad had with his dad and his brother and uncle and what have you, and I think that Brad has become a technician. I mean, he’s smart, he’s engineering savvy. Obviously Mark went to Brown. Brad didn’t make have that opportunity. 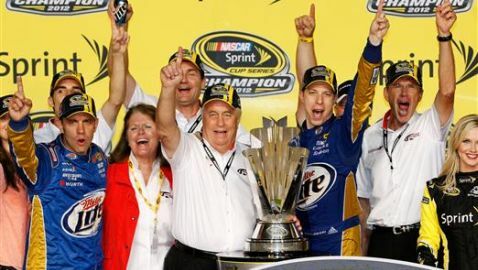 But I see them as pure team players, and I think that’s the great teams, you look at Jimmie, you look at Jeff, you look at Earnhardt, all these guys, what they built, the camaraderie, think about Earnhardt Sr. and Childress, these things grow together, and I think what’s what we did with Mark and obviously that’s what Brad has been able to do for our team. So I see them a lot like that; they’re the glue, they’re the builders. Q. Paul, how dire a situation did you think you were in when you knew you were going to have to pit one more time and Jimmie was leading? PAUL WOLFE: Well, I knew we — it wasn’t going to be easy, and we weren’t in the best situation we wanted to be in. But like I said before, part of that is just — I wish we had a little more speed in our car tonight. I thought we would have. But at the same time I think we were just being smart. It wasn’t a great feeling, I can tell you that. It definitely wasn’t. But at the end of the day, regardless if the 48 went to the garage or not, we were able to overcome that by taking the four tires and pitting twice for fuel and being able to work our way back up to 15th. Q. This is a simple question for either one of you. What did you do with Brad? ROGER PENSKE: I’m not sure. They had a lot of people moving us around out there. He’s out there somewhere, still probably drinking Miller. PAUL WOLFE: No, he’s doing an ESPN deal right now. Q. Paul, when Jimmie came in and topped off, you guys elected to stay out. You talked about it a little bit, but how difficult of a decision was that, and were you worried that that was maybe going to come back to haunt you? PAUL WOLFE: Well, it was tough. I didn’t realize actually those guys were going to give up all that track position and come pit. When they all came and we didn’t, it was definitely put us in a situation. We felt like there was a pretty good chance of a caution, but it just kind of all played out the way it did. I wasn’t — like I said, it wasn’t our best race we put together during the Chase, but we had great reliability through this Chase and were able to be around there at the end, and sometimes that’s just as important as having the fast race car. Q. Roger, now you finally have your first Cup championship. How do you feel, and I mean how do you feel? Don’t give me all this stuff about the organization and how happy you are. ROGER PENSKE: Well, personally I feel amazing that I’ve been able to achieve this in racing. I’ve lauded the people that have been on that stage for so many years in Las Vegas and New York, and to be able to join this elite group and say that I’m a champion in NASCAR means a lot, and certainly as I said earlier it takes a lot of people, but I think it took the guts for me to stay in the sport. We could have thought, well, we won the Indy 500 15 times and we’re a big deal, but I’ll tell you one thing: Until you get here and you compete at the top and win it, you really know what’s happened, and I think I just woke up here tonight, and it’s a big thrill. Q. And Paul, when you were teamed with Brad, you got a pretty raw driver who was aggressive and he sort of built a reputation. You won a Nationwide championship with him and now three years later you’ve got a Cup championship, and he won it in his 125th start, and the number before that, the only number that beats it is Jeff Gordon who won it in his 93rd start. You two are the only two who now have a Nationwide championship and a Cup championship, so you’ve done pretty impressive stuff together in three years. Did you think that you two could do that together in three years, a pretty short time, especially considering, as I said, what you got when you got him? He was pretty raw and had a long way to go. PAUL WOLFE: Sure. When Brad and I first got together, part of the reason I was excited about working with Brad is because I had seen him win races in cars that I thought weren’t as good as maybe cars I was putting on the racetrack at the time. As a crew chief or a team, that’s always what you want, you want a guy that you know can win races when you might not have the best race car out there. So I saw that in Brad, and at that time I was — I’m kind of the guy that takes it one day at a time and try to be better each and every day at what I do, and never really looked at it from the standpoint of I want to go win a championship with him, it was I want to go win races and continue to grow as a team. We’ve done that each and every week and every year, and now we’re rewarded with a Cup championship. Very excited about what we’ve been able to accomplish, but I guess when we got together in 2010 I wasn’t looking at it from the standpoint of going and winning a Cup championship. Q. Roger, following on Jenna’s question, when Robert Yates won the championship with Dale Jarrett, he was a respected engine builder, had won many races in NASCAR and won Daytona 500s, but he said that as an owner it puts you in a very special club, and I’m wondering if you thought about that, and are you going to change your license plate? ROGER PENSKE: Wow, it says INDY 1, I guess I put NASCAR 1 on it right now. I guess that might be right. No, it’s a special position to be in as an owner. Obviously, as I’ve said before, it’s a goal that I wanted to achieve, and I tried hard. We were close in ’93 with Rusty finishing second and then third in ’94. That’s a long time ago. The competition has gotten tougher, and I think that any one weekend there’s 10 or 15 cars that can win, and I think for us to be able to have the continuity, and it’s a team, we’ve built a special team here, and I’m proud to be the leader, but on the other hand we delegate down to people like Mike Nelson and Travis and obviously Paul and Tim Cindric gets a lot of credit for kind of putting this whole thing together. When I can be part of that group and then say we’re at the top of the sport in 2012, it’s a goal I’m sure everybody wants — where they want to be. Q. For Roger, I hate to throw more numbers at you, but Brad is, I think, the third guy in the last 28 years to win when he was in his 20s. Jeff and Kurt Busch also were in their 20s when they won. What do you see in his future? Is this just the beginning? Do you view him as a guy who can win multiple titles? And I also I guess wonder about your future, if you’re in it for the next long haul, as well. ROGER PENSKE: Well, you know, I think you said it. Jeff Gordon is the only one that won the championship at that early age, and you can see he’s won multiple championships. I can tell you this, that Paul already said to me we’ve got to go to work Tuesday morning and get ready to go next year. So it doesn’t take long to have it sink in, and we’ve got to think about the future. Obviously Brad has got not only the raw talent but I think he’s a thinking driver. I think his windshield is bigger than people realize. He knows what’s going on and takes care of his car. You could see it on the restarts today, he wasn’t going to go and over-rev the engine, maybe lose an engine because of a valve spring. But I think he’s going to be a multiple champion, and I hope that Paul and the team can continue to grow on the success we had this weekend and this year and we can go on and do it again. As far as me personally, I guess I’m going to come to the races for as long as I can. I don’t have a deadline, I don’t have a number. I guess at this particular point, this racing keeps me young. My number is one I don’t talk about. But I need a couple more championships, sure. Q. Paul, the race clicked along for quite a while with you and the 48 both running in the top 10, and there was no space for them to make up that distance. When did you begin to think, okay, those guys are going to do something different, something unusual to try to create at least the possibility of making up the space? PAUL WOLFE: Well, I wasn’t really sure. You know, we were kind of holding our own there I felt around 7th or 8th, and we had a small little hiccup on a pit stop and lost a little track position. Brad was — got back after it after that stop and got ourselves back in the top 10, but it seemed like our car just started to fade there a little bit, and I don’t know if that was from him pushing it real hard trying to gain back the spots we had lost in the pits. But at that point obviously the 48 was slowly working their way to the front. I knew that it wasn’t going to be easy, and we continued to work on our car and adjust on it. We were hanging right around the edge there, but I thought we would be much closer to the top 10. But we just kind of got ourselves in the situation we were in and got off there, like I said, on that fuel strategy there at the end when they all decided to come down. But with cutting the last run in half basically and coming for tires and fuel, we were able to make some of that ground back up, and I think that was definitely what helped us there at the end. Q. Roger, you talked Friday about Brad constantly giving you lists of things for the team to accomplish. Has he given you one yet for 2013? ROGER PENSKE: Well, it’s not only Brad, it’s Paul. I think that he told me I’d have a list on my desk by Wednesday. So I’m sure they didn’t want to give it to me already — come on in here. Are you bringing a list? BRAD KESELOWSKI: I brought it with me. I didn’t want to lose it. ROGER PENSKE: Did you bring your tweeter? That’s all I want to know. BRAD KESELOWSKI: That’s heavy. Oh, no, it’s not. Paul is wearing some of it. Look how dry your shirt is. ROGER PENSKE: You didn’t have goggles for me. Q: Brad Keselowski has joined us, and Brad, I congratulate you for winning that championship. Just tell us now how it feels. BRAD KESELOWSKI: It feels pretty good. It feels really good. I can’t believe how everything just came together over the last — what’s it been, three years? Has it been three years we’ve been together? Three years Paul and I have been together. We’re two for three, Paul, I was just thinking about that. Two for three. That’s — what is that, .666 average? I don’t want to round up there. But that’s pretty good. And you know what? I feel like the best is yet to come. I really do. I feel like this team with these two people sitting next to me that we can do anything we set our mind to if we work together like we have over the last few years. I really do. And I just feel so fortunate to be where I’m at right now in life and with racing, to have guys like this around me because you’re a product of who you surround yourself by, and I’m surrounded by the best. That’s as sweet as life gets, to know that you have people around you that can make up for you when you make mistakes, because we all make mistakes, and I make a ton of them. But I know that when I make them, I’ve got people that got my back. So thank you, guys. Q. Brad, can you sum up your season in 140 characters? BRAD KESELOWSKI: (Laughs.) That’s going to be at 3:00 a.m. Oh, man, I’m almost out of characters. Let’s see. Well, you know, starting from Daytona, we obviously didn’t start at Daytona the way we wanted, got caught up in a wreck, but we knew we had some speed in our cars. As the middle of the season and the spring came through, we had them fuel issues, we rallied deep, found a way through them, and when the summer stretch came, we didn’t have the speed we wanted through the summer. But what we did have was execution that was incredible, and I knew it right away. I remember some of them races, the spring Pocono race; do you remember that, Paul, where we had them troubles with some part on the car and we fixed them and came back from what should have been a 30-something place day and finished like 16th, and I knew right then, those days right there, I knew that if we could do that in the Chase with speed that we could win it. And then obviously as Michigan and some of those other races unfolded and we continued to work on our car and showed the speed that we did at Chicago, I knew that we had a shot at it, and obviously winning Chicago was a huge catalyst. But once we won Chicago, I felt like we could do it. I really did. And I knew that we had the speed. So many mile and a halfs in the Chase and all of them aren’t away like Chicago, and I felt like at that moment that we had a group that could get the job done. Q. You sat in here Thursday and heard Jimmie talk over and over again about how at some point you were going to feel the weight of this race. Did that ever happen? BRAD KESELOWSKI: I don’t know, did that ever happen, Paul? It’s not fair for me to answer because I’m just going to say no. I don’t feel like there was a part before the race where I was stressed out. I was stressed out over that yellow flag cycle at the end because obviously the right call there was probably to pit, but that’s not the way it played out for us. I’m so thankful that we drove back to 15th so that I don’t have to hear for the rest of my life about how if the 48 had not had them problems he’d have won the championship. So thanks, Paul, for doing that. But there were some doubts at that moment when that whole cycle was going through, and you just don’t know who’s on what strategy. I don’t know, I’m driving a car, and I’m listening to them, and I can hear their voice and their voice wasn’t real confident, I can tell you that. So I’ve got to re-watch the race, and maybe I’ll have doubts then. Does that count? You ever do that, you ever watch a race and you know what happens at the end, and you’re like, no way, that can’t happen? Yeah, maybe I’ll have doubts then. Q. Did you have — after Jimmie had that problem, did you have that kind of exhale moment where you figured, hey, I’ve got this? Just describe your emotions. BRAD KESELOWSKI: I didn’t know what kind of problem he had. I knew he had a loose lug nut, but y’all know he comes back out and he’s right back in the game. That was really the extent that I knew. BRAD KESELOWSKI: I wanted to win the race, absolutely. I was just hoping that the race would play out to give us an opportunity to do so. Obviously it didn’t, but I wanted to win the race the whole time. I don’t really enjoy watching hardships happen to my competitors. I don’t enjoy it. In fact, I hate that. I want to beat them on the racetrack. I want to beat them by being the best that we can be and out-executing them and winning on the racetrack. I don’t enjoy at all watching things happen to my competitors that take them out like that. I can tell you that I wasn’t cheering; how about that? Q. Do you have any kind of estimate on how much of your sponsor’s product you had consumed when you did that TV spot? I’m going to get it back tonight. ROGER PENSKE: I told them that you were commercially viable now after all that work on Miller. Q. How would you describe your demeanor in the car? Were you extremely nervous when you knew there was a chance you were going to be off the pit cycle from everybody? BRAD KESELOWSKI: Well, I couldn’t see the whole picture, and that’s so frustrating in the car. I wish I had one of those Fan Visions or something like that in the car. I need one of those so I can understand what’s going on. But I have to trust these guys. You know, that’s what a team is. It’s a group that trusts and respects everybody that’s around them, and like I said, I could hear from Paul and my spotter Joey’s voice that they didn’t sound all that confident. So I was very curious how it was going to play out. BRAD KESELOWSKI: I don’t know. I don’t have enough information. You know, I don’t know what’s going on. Q. Brad, you’re such an easy-going guy, you interact with fans on Twitter, you’re always talking to them, and out tonight it was like your crowning achievement yelling at the crowd and you’re going to be on TV, and tell NASCAR fans who may not have been a huge fan of you before this, what can they expect from Brad Keselowski as the reigning NASCAR Sprint Cup champion going forward? BRAD KESELOWSKI: Expect the unexpected. That’s my MO, right? I can’t answer that. I don’t know yet. I know that you can expect from this team to come back next year and try to be better than ever and try to improve and find that next level of success. I know that’s what you can expect from this team, and I’m going to be right there with them. Q. Brad and Paul, last year with we were here and saw what transpired between Tony and Carl Edwards, many people said we’ll never see that kind of stuff again. Thanks to Mike Forde at NASCAR, I just saw that your finishing average in the Chase is 6.3 this year, which is exactly what Tony’s was last year. Just what would you think about matching kind of, not in wins but overall, you talked a lot about execution but being able to match that? BRAD KESELOWSKI: Well, I mean, Tony has done a lot in this sport, and I don’t know what the points totals were, and I guess you would have to look at that more so than the finish average because you’ve got bonus points and things of that nature that play into that. So they’re the same? Oh, okay, all right. I don’t know what Tony’s were. It would have been close, either way. It’s a good rule of thumb if you score 400 points in the Chase that you can win it, and I think that was the point I made third or fourth race in. Didn’t I say 40 points a race would win it? Dang, I feel good about that. I like being right. That’s a good rule of thumb, and I feel like we did a great job throughout the Chase. It’s hard to compare years of the Chase because there seems to always be some kind of variable, whether it’s the — we all talk about Talladega every year and this year we had the repave at Kansas and some fuel mileage stuff at Dover, and it’s never quite fair in my eyes to compare year after year, and what Tony did was a phenomenal accomplishment. He won five races in the Chase. No other driver has even come close to that from what I can remember. And I don’t suspect anyone ever will. So he deserves all the credit and accolades that he received for that accomplishment. So we’re right there with him, and it’s been a great season, and when you’re right there by a guy like Tony Stewart, you’ve got a lot to be proud of. PAUL WOLFE: Well, I mean, I don’t know, just to be able to battle the 48 like we did, and we both won races in the Chase, we both had some races where we didn’t run well, but I think when you look at what they’ve been able to accomplish over the last whatever, 10 years say, they’re definitely the best at this game. I think that even makes it more special for me to know that we went head-to-head with those guys all the way down to the last race. Like Brad said, every year is a little different, a little different scenario. Obviously Stewart was able to win more races, but it was definitely a lot of fun racing with Chad and Jimmie like we did. Q. I’ve got a question for Roger and a question for Brad. Roger, when Brad was mired in traffic, you and Walt and Bud and Tim pulled away from the railing and you guys looked like you were having a powwow. What were you discussing? ROGER PENSKE: Well, I wanted to really, I guess, when Jimmie made that move, I wanted to understand when he came back out on the racetrack where he was. I knew he was a lap down. I didn’t know how many cars were between where Jimmie was and the lucky dog, and that’s where I think we had some cushion. I think there were seven cars at that point. We’ve got to be careful giving Brad too much information because he’s got to focus. I think one thing that hasn’t been said tonight, as we started he felt the car had a little understeer in it, and he was taking care of his right front tire, and I think that’s one thing that the race that he ran tonight was a race to the championship race. You always want it to be fast so you can see the car at the end when it was time to go and even some of the time we had to catch up. But we were just talking about that and then deciding to communicate back to the guys in the pits. They knew that, and I was really — I even felt at the end that not everybody was going to have to make a stop, so we had a good chance that we’d be able to pick it back up even if Jimmie was out there. I was trying to stay as calm as I could. It wasn’t easy, so I had to get some people around me to help me. Q. Joey said something to you on the radio which I found curious. He said — all I can remember is “what part of he doesn’t have any brakes don’t you understand”? BRAD KESELOWSKI: Oh, I’ve got to tell this story. This is a great story. You’ve never heard this one, Roger. BRAD KESELOWSKI: Joey is my spotter, and the first time I worked with him was — it might have — it was the first couple races I worked. I’m not going to say it was the first time but really close to the first time, I was at Charlotte in 2007 in the spring race, and my dad was crew chiefing, and we were driving — I was driving, I should say, this car for this guy out of Kentucky, and it was really underfunded and we made the show. And keep in mind 2007 was a really tough year to make the Nationwide races with all the double digit cars and so forth, and we made the show and it was great and it was anything I could have dreamed it of, and it was just one of those starting to break in. So Joey is alluding to that because we were together as we were breaking in, or he had already been part of the sport but I was breaking in with him and that’s when our relationship really started. And so anyway, this race — there’s two parts to this story. We changed our right front spring once in practice, and Paul will appreciate this because he’s a crew chief and a car guy, but in order to put a right front spring in you’ve got to lower the suspension down, and these cars have brake lines in them, and it’s flexible brake line, but the way the spring went in the brake line was too short and it broke. So we changed the spring and I went out on the track, and about that time, the yellow came out for practice, somebody wrecked, and it was right at the end of practice, and so practice got canceled right there, but I was already out on the line. And for those of you that have been to Charlotte and know how that works, at the end of Nationwide practice, Cup qualifying begins, and so for whatever reason, I don’t remember exactly why, instead of doing a lap around the track and returning to the garage, everybody did like this half lap backwards down that quarter-mile track they have at Charlotte. Well, I didn’t realize I didn’t have any brakes. We grabbed like second or third gear, we’re going like 65 miles an hour backwards around this racetrack, and I make this right-hander into the quarter mile, and the whole Cup field is there for qualifying, and I mean the whole Cup field, and I’m going like 60 miles an hour, and I go to hit the brakes. Nothing. And all I can see is all these people, all these cars, and Jeff Gordon’s car is right in front of me. I’ve got no brakes, and I’m out of control. So I make this hard left and go through the infield, and I just tear this car all up, and the wrecker driver comes and gets me, and he yells in the window in this very southern voice a couple obscenities, basically saying what were you doing. I’m like, I didn’t have any brakes. So as it would happen, we replaced that brake line with another brake line that just happened to be even shorter and broke in the race. So we get in the race and we do this first run in the race, and I’m running pretty good, I’m running like 15th or 20th, which again, for where I was at in my career was great, it was awesome. That was all I could ask for. And there’s a green flag pit cycle, and getting ready for the green flag pit cycle and I pushed the brakes, we’re halfway through the run and the brake line breaks off this car, and so this car won’t stop, won’t stop. So we talk about it for 15, 20 laps, and we’re talking about when this green flag pit stop comes we’re going to have to get the car stopped because the car is not going to stop, it’s got no brakes. And we get on pit road and I go to pull into my pit stall and everybody jumps across the wall, jack in hand, everything, and everyone forgot that I had no brakes, and I just, vroom, right through the pit stall. So I go — this is in the middle of green flag pit stops, so I am like 20 boxes down, no brakes, so the whole crew runs over and starts to push the car backwards, and I get — Joey is spotting the whole time, and Joey is over the radio, oh, my God, and Joey is real exaggerated about it. They’re pushing my car backwards really, really fast, and I get five stalls away, and they’re pushing me backwards, and they do this like push off motion like a bobsled. So what happens? I still have no brakes. So I’m going down pit road at what feels like 35 miles an hour. I know a human being can only run like 10 or 15, but it felt like this car was going 30 miles an hour backwards under green in the middle of green flag pit stops, no brakes. And of course so what happens, I go flying through the pit box backwards and almost end up on the racetrack backwards. My dad comes over the radio at that moment and goes, “What part of no brakes don’t you understand?” And he just goes off on these crew guys. For me and for Joey, that was one of those moments where we bonded together and just have told that story, and Joey has been with me almost ever since. So that’s how far Joey and I have come together. But we still tell that story all the time. So now you know the story. That’s my racing story. I don’t think you guys have heard that, either, have you? Q. It’s well documented I guess you went to visit Roger in 2008 and you wanted to drive for him and you felt that you could win him a championship. It wasn’t really an organization known for drivers wanting to go there and win championships. Why did you think that you were the right fit for the organization? I don’t think that you were a guy with white starched shirts in your closet and sweater vests and things like that. BRAD KESELOWSKI: I am now. I am now. I’ve got a couple of them (laughing). Q. I mean, what made you think that you’re this Penske material guy and that you were the one that could fit, because you don’t seem like you’re part of the mold and yet here you are three years later. BRAD KESELOWSKI: When I walked through the shop, that was the moment I knew, because I walked through the shop, and you know, you can’t race a shop, and I’ll be the first one to tell you that. But I knew from that moment what level of commitment that Penske Racing had to the sport. And all the pieces were there to be successful, and the fact that RP spent the time with me to — he didn’t have to talk to me. How old was I then, 23, 24? He didn’t have to do that. You had just won the IndyCar championship that year — I can’t remember, I think you won the 500 that year. I remember that because I saw you and I said, “congratulations, 500 winner.” I think Helio had just won it. He didn’t have to talk to me, he just won an Indy 500. So I could feel all the pieces were there, it was just a matter of kind of putting them in the right order, like this great big jigsaw puzzle. And I don’t think we have every piece perfect right now, I’ll be the first to tell you, and I imagine Roger would tell you that, too, but you knew they were there and you could make something out of it and the picture could be made clearer and you could be successful, and it was just a matter of time and commitment until it would be successful, and I felt like with the right time and commitment that we could do that. Q. And at the time you were kind of raw and you were aggressive on the track and you were building this reputation, maybe not the right reputation. Did you have to make a conscious decision or change anything consciously or maybe look yourself in the mirror? Is it anything that you had to do, or was it just natural to get you from there to here? BRAD KESELOWSKI: Well, I think I suffered from some serious confidence issues when I first came into Cup that were a result of, you know, a lot of things, mostly just not having the speed to be successful and trying to do too much. I was trying too hard to be the I in team, and there is none, and that’s pretty obvious looking back now. But I didn’t know that. I do now. But it’s not until you have a group around you that shows you that you don’t have to do all the work, that you can share it, and that as long as you respect them, care about them and work with them, you can be successful. And that’s something I had to learn on my own. I never had anybody teach me that. Nobody ever taught me about teamwork. That’s something I had to learn on my own. My family and my parents, my mom and dad, they taught me about work ethic, they taught me what it meant to be a part of a family that had each other’s backs, but it’s a lot different when you’re not family. It’s a lot different when you walk into a group, what are we, like 390 employees now, 350, somewhere in that neighborhood, I’m not related to any of them. Or that I know of. ROGER PENSKE: He is now. BRAD KESELOWSKI: Right, I am now. So it’s completely different trying to motivate somebody that you’re not related to whose livelihood doesn’t necessarily depend on your success. To some extent it does. And so from that standpoint I didn’t understand team work. And growing up and being a part of the sport and being around people like Paul and Roger taught me how important that is. And I think that’s been most influential to my success over the past three years. Q. When you go to — when you went to Roger’s place, you had to know that you were coming up and going to work for a guy who had some really great people that worked for him like Mark Donohue who got his first NASCAR win, Rick Mears, Helio and things like that. What do you think about your place in the history of Penske Racing now that you brought him the first Cup championship? BRAD KESELOWSKI: I think I’ve got a long ways to go to keep up with those guys, and there’s a lot of work to be done. And like I said, I feel like we’re still at the beginning. I don’t feel like — you can’t judge something off the beginning. You know, if you were building a house and you just looked at the foundation, it doesn’t look like much of anything. I feel like we’re very early. We’ve got the cement poured, and I want to keep building. Q. You like sayings. There’s a saying, “revenge is a dish best deserved cold.” You go to Daytona, okay, beating a team that year in, year out, other than last year has been the toughest competition, and time and time again each of you have come over to congratulate you. So I was wondering, this cold revenge, how is it going to feel when you show up in Daytona? Q. The revenge here of some criticism that you were upset with last week. BRAD KESELOWSKI: Oh, okay. Yeah, I mean, I tried real hard to not be motivated by negative. I don’t think that’s healthy. Not long-term. Short-term it can create a fire that can roar beyond your wildest dreams. But the problem with that fire is that it burns yourself down in the process. You can’t be successful with that. I’ve tried really hard to not be motivated by hatred, revenge or any of those things, and I think as a group we’ve done a good job of not doing that. So there was no part of me that took any celebration in proving that part wrong today, or maybe it will be different; I don’t assume it will. What I take pride in is the group of guys who joined Penske Racing in 2010, starting with Paul, and I look at the car chief Jerry Kelly, I look at a guy like Brian Wilson, who’s my head engineer, whose career was really on the ropes before 2010, and I look at those three people as being three of the key players that together I don’t know where we’d — I don’t know where we’d have been apart. I don’t know. I can’t imagine we would have been this successful. Maybe I’m wrong. But when I look back at this — at least in this moment, I think of those three people, and I think how proud I am to be a part of taking them from the unknown, because I was right there with them, to where we’re at today. Obviously I look at RP as being a piece of that, as well, and doing something that nobody else has ever done with Roger, which is something very special. You know, obviously I was in that whole Hendrick mix in 2008 and ‘9, and winning it for Roger is much sweeter than that ever could have been because I know this is an accomplishment nobody else has ever done. Those are the things that I think of, not any revenge or anything like that. I’m not motivated by hatred. Q. You’re going to be a champion like NASCAR has never had before obviously by default because you’re 28 years old and also because of expect the unexpected. Jeff Gordon was in here and said you’re going to do a great job as ambassador, but also winning a championship changes you. How are you expecting that being the face of NASCAR might affect you and change you? That would be really cool, don’t you think? Do I have to pick one? Maybe I shouldn’t have said that, Kerry. BRAD KESELOWSKI: Not a Kardashian. I’m just throwing that out there. Q. Brad, first of all, can you tell us how many Twitter followers you picked up tonight? BRAD KESELOWSKI: I don’t know. Let’s check. I think I started at 328. Yeah, you take so much stock in the amount of followers. It’s probably not that many. So 6,000. That’s something. Q. Roger, you compared him to Rick Mears I guess a couple days ago. When you see what you’ve seen over the last couple of hours since victory lane celebration, do you want to amend that? How do you describe that? And for a guy that’s rather conservative like you are, how do you deal with that? ROGER PENSKE: Well, you know, maybe I am conservative, but I like to have a little fun, too. And I think when you’ve won the NASCAR championship, the driver you can kind of give him a little wider path, and he’s certainly taken it side to side. I think it’s all good. Q. To both of you guys, Roger and Brad, the folks back in Detroit I know are really proud of both of you and would probably like to have a beer with you, Brad, for sure. What do you say to them? It’s been tough up there, and champions have been rare in recent years. BRAD KESELOWSKI: Are you taking that one, Roger? Q. This is for both of you. BRAD KESELOWSKI: Wow, what do I say to them? I don’t know what to say. At some level you hope it somewhat speaks for itself, that if you work hard enough and long enough that things will find a way to happen. I’m proud to have accomplished this goal with another guy that takes the community in that area so seriously. I know RP does. I think we all know that. And that makes it that much sweeter. But I don’t know what to say to them or to anyone in that area. I just hope that it speaks to them and that it helps them find happiness. ROGER PENSKE: Obviously my commitment to downtown Detroit started with the Super Bowl back in 2006 and spent five years getting ready. It was interesting, we had a great Super Bowl, and I got to know a lot about the city, and there’s no question that we’ve been through some tough times. But when I see the renaissance that’s taking place there now, it’s amazing. The companies that are moving downtown, the young people that are moving downtown, and for us to bring this NASCAR championship, I’m not sure — it’s not Charlotte where people understand the sport. They understand the stick-the-ball sports in Detroit. They’ve had great hockey teams. The Lions have done better and the Pistons at some point, but to me to bring home this championship, I would have to say in my words, that’s like bringing the Super Bowl to Detroit with this young man winning in Michigan and being from the Detroit area. Hopefully he’ll get his due and what he deserves for being this great champion, and I’m just glad to be part of it myself.